So… no weekly recap for this week! There is not really any news in the World of BUTAOTOME, except for the announcement that they’ll be at Reitaisai 15 in May and have a new album. 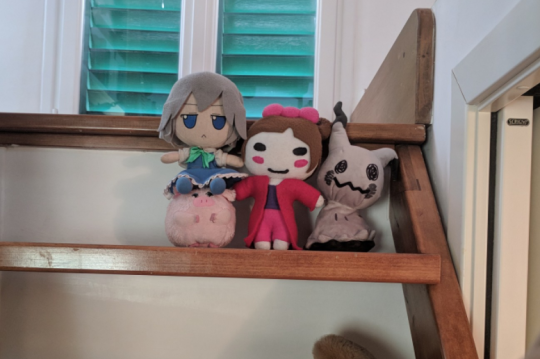 But have anyway your weekly pic of Chibi Ranko and co., feat. a shiny new friend. With this track, now we have a BUTAOTOME vocal arrange for each one of the six Alice’s themes. (does anyone care about that Soku pre-battle theme?) I feel like Comp, in most of the recent Touhou albums, is not experimenting as much as he used to, but the song is still good and it brightens my mood! I enjoy singing along with the refrain! Holy CompSheep, Paprika made a song even Scott loves!! It’s a song dominated by the inclusion of a harpsichord, which gives a sort of classic feel that makes it stand out quite a bit even compared with MiChi, the previous the Grimoire of Alice arrange. An instrumental re-arrangement of a certain rachachacha song from Jitsuwa. Compared with the one found in Nekokenban 7 is very different, and also closer to the original vocal song with the melody. It’s the karaoke version of the first track, what should I say? You can do your trashy vocal cover if you want, or pay more attention to the instruments! The physical release has, from the comments I read, a nice smell. According to the Sis, she tried to give the disc Alice’s scent, and the other two Music Rooms will have their own unique scent, associated with Marisa and Patchouli. Overall, the single is so good: I’m eagerly looking forward the next two discs (especially the Selene’s light track) and hopefully a full album, which might be a complementary work with Itanshinmon!